Forgetting traumatic experiences is necessary for survival in the present, psychology tells us. The easing of emotional pain over time is due to these details becoming less accessible to our consciousness so that we are not overwhelmed or hindered in our grapple with present circumstances. The good ‘ol days, in other words, were never as good as we think. But Mkhuseli ‘Khusta’ Jack remembers all of it, and his autobiography is enlightening on many levels. The Jacks were poor but dignified in their ability to sustain themselves on land that never gives an inch. Working hard, but working for themselves. The bucolic life of milking the cow at dawn, every dawn, and keeping fit with a myriad of chores. Until the age of six, when everything shattered and childhood ended way before it should. A white farmer suddenly announced the family had to be gone by sunset the following day, leaving nothing behind. “It was the beginning and end of my world. I had no idea that there was a white owner – a boss of our lives,” writes Khusta. And so the family was scattered across the landscape. This brief childhood, cut short, is dealt with in the five pages of Chapter 1. It is worth an entire novel. Khusta is so brief and matter-of-fact that we are tempted to believe it had little effect on him. He assists this deception by saying, within a page, that arriving late at night at his uncle Oudenk’s house was “exciting for me and the other children”. Khusta went on to battle every obstruction of geography and state to get an education, he walked the life-threatening tightrope of political consciousness right into the very heart of struggle in the Eastern Cape during the height of the apartheid crackdown and was subjected to torture and imprisonment as a result. All of this he goes through in the same matter-of-fact style. Yet, at the end of the book he mentions that six-year-old again. Which is his way of explaining, almost apologetically, why the family lodged a land claim. There is nothing in his autobiography that betrays a man seeking fame and glory. 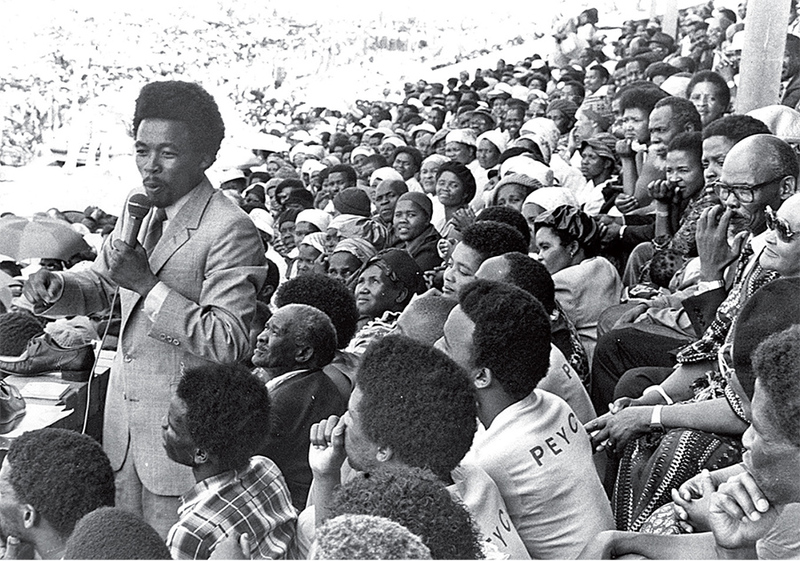 It was not a love of politics or the limelight that drove him to stand up on stage and deliver fiery oration at packed community halls, to end up leading the UDF in an Eastern Cape ground under the jackboot of the same security cops who murdered Steve Biko and later, the Cradock Four (Matthew Goniwe, Fort Calata, Sicelo Mhlauli and Sparro Mkhonto). It was an awareness of the injustice of the state that drove him. He was not a politician, he was an activist, and when the fight was won, he walked away from it, turning down a well paid position in Mandela’s new government in favour of starting up his own business. He tried to resist being drawn into the forefront of the struggle, his loyalty torn in his attempts to stay out of trouble so that his schooling would not, once again, be interrupted. His resistance almost comical in its ineffectiveness before his first and only academic failure – his matric – saw him surrender his quest for education as he allowed himself to be catapulted to the front of the mass movement, sacrificing his youth and endangering his life. Only after peace was won could he go back to his studies. Yet despite all the difficulties, the deprivations, torture and eventual imprisonment, there is no trace of bitterness. It’s a lack of bitterness that sees him assisting his former torturer, Gideon Nieuwoudt, whom he testified against in the TRC during 1996. “I had seen him some time in 1995 when he came to my office to ask me to intervene on behalf of his son, who had been excluded from the provincial Craven Week rugby tournament because of who his father was. He asked me to speak to the black selectors. Khusta was right in the centre of Botha’s total onslaught and shared the intimacy of danger with many people who became large political figures, but if you’re looking for smalanyana skeletons, there’s none to be found. Although Khusta doesn’t mince his gruff impressions of the many people with whom he interacted , he doesn’t tell other people’s stories. He also doesn’t forget to mention a good turn. But there is a gap in the writing. It’s the lack of what Khusta feels, of how it made him feel at the time. We want to be surprised by emotional insight, by poetry. It’s also possible emotion was an indulgence he could not afford during his adolescence, like movies or girlfriends, and that repression has left its mark. But there’s also something to be admired in that sort of levity, the uber masculinity of its brusqueness. Kinda Cormac McCarthyish. He’s not blowing any horn, he’s just telling a story. The lack of sentiment itself a testament to the innate modesty of the man. And by simply putting down what happened , the book, possibly without even meaning to, pushes back the ANC’s rewriting of struggle history. For Khusta and his comrades, although the ANC was a touchstone of revolution, it was distant, in exile or in prison and heard only through the banned Radio Freedom. By co-opting the sacrifices of hundreds of people like Khusta, who fought not for a liberation movement but for liberation itself, the ruling party has committed its own injustice against those who built the very foundations upon which it now arrogantly stands. To Survive and Succeed – From Farm Boy to Businessman, is published by Kwela Books, an imprint of NB Publishers. We need the contribution of the likes of Khusta.